If I had to choose just one herb for my garden, it would have to be basil. 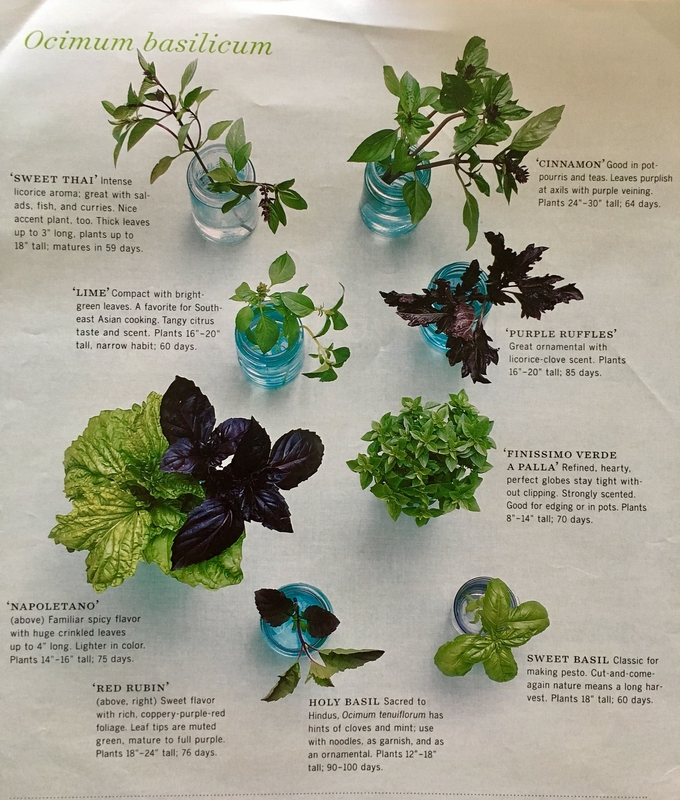 Granted, I would want every variety of basil, from Genovese to Thai, lemon to lime, but I would be happy with just basil. Growing a garden of basils would satisfy my kitchen needs, flower needs, sensory needs and make the pollinators in my garden happy, too. 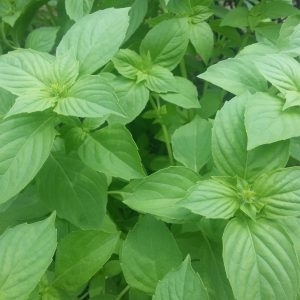 For many of us, a plate of pasta con pesto was our first introduction to basil (Ocimum basilicum). And a pizza margherita or insalata caprese is just not right without fresh basil. Many regions in Italy claim basil as their own. 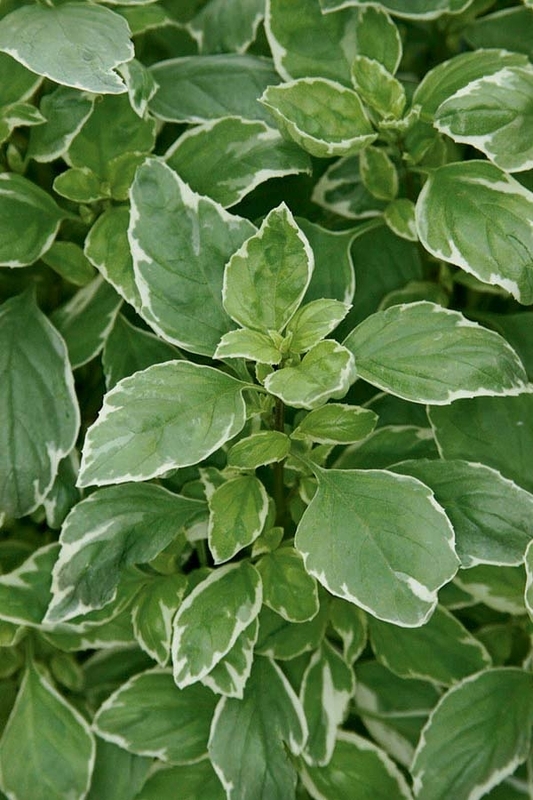 Neapolitan basil, Genevose basil, classic basil…all are delicious and pesto-worthy. But they have subtle differences that you will have to discern for yourself. 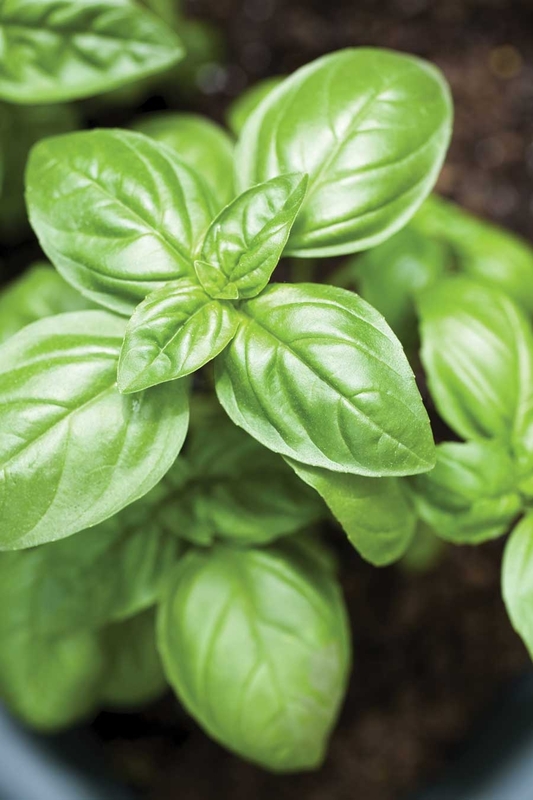 Basil like lots of sun; rich, loose, well-draining soil; and a reasonable amount of water. Occasionally feeding with diluted fish emulsion and keeping the plants pinched and flower free are the main tasks to keeping leaf production in full force. Harvest by pinching leaves or flower stalks above the point where two new branches grow. The more often you harvest, the bushier and more prolific your plants will be. Basil seedlings can be planted six to twelve inches apart and generally grow two to four feet tall. Whether you buy seedlings or purchase seeds, planting directions and spacing should be on the labels and envelopes. Start basil seeds indoors now and plant out seedlings when the weather is warm. 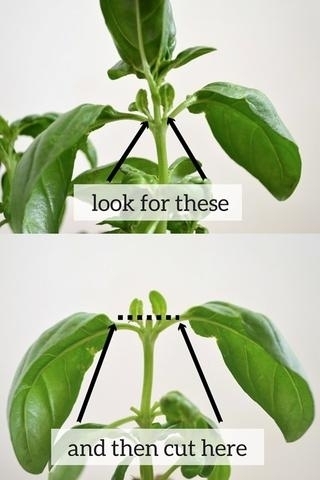 Alternatively, wait a month or so and you'll find basil seedlings at local nurseries. Basils come in many sizes, from six inches to six feet. Leaf color ranges from chartreuse green to deep purple, and fragrances vary from cinnamon to lime. Even if you think you have no room, or no garden, there is a basil for you. Piccolo basil and Greek dwarf basil are two compact varieties that fit tidily in a pot on the windowsill and still deliver a burst of flavor. Kitchen windowsill pots make it easy to pinch and use basil on a whim, always fun for creative cooks. 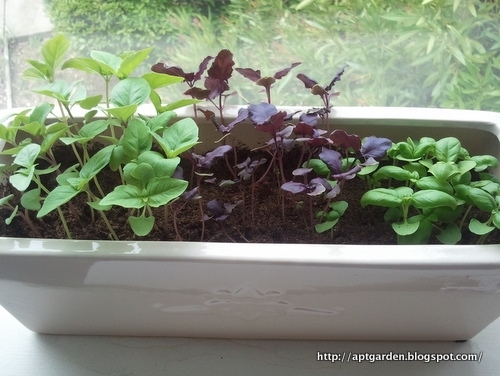 Basil can grow all year long in a sunny window and larger plants in pots do well, too. 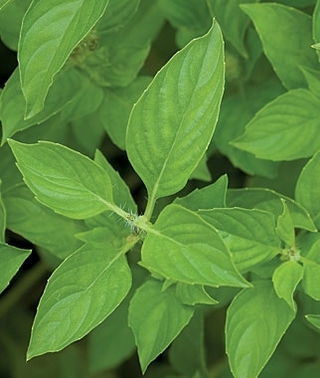 Lime basil, Thai basil and Sweet Thai basil all originated in Thailand. 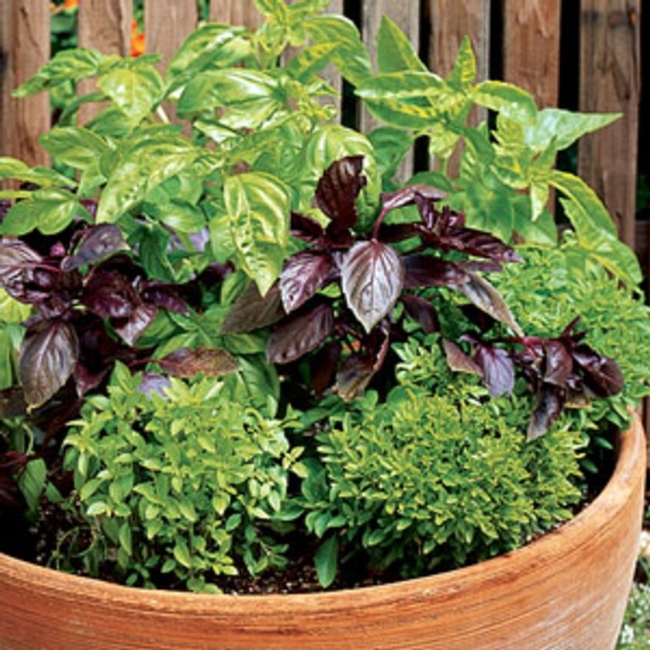 Thai basil has a cinnamon-like fragrance to me and striking purple flowers that spring from bright green foliage. Thai basil would have a place in my garden even if it never made it to the kitchen. It is a beautiful companion to the all the opal-leaved basils. Lime basil and Mrs. Burns lemon basil generously share their bright citrusy scents with anyone willing to give them a little squeeze. Both types make interesting pesto for fish and salads, or a fresh chiffonade for topping stuffed eggs or potato salad. They are just fun to experiment with. Bright fragrant leaves and lovely flowers for bees and bouquets are a bonus. As florists are discovering, basil also makes a fragrant filler in floral arrangements. Two years ago, my husband and I set up a little farm stand. In addition to growing regular basil, we had a lush bed of Lettuce Leaf basil. It was the first time we had grown it and we did not know what to expect. The seed was easy to broadcast when the weather was warm. It germinated in about a week. 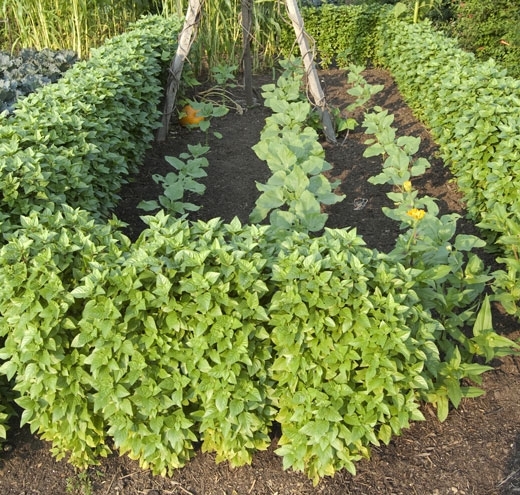 As it grew, we thinned it and used the thinnings in salads along with lettuce. 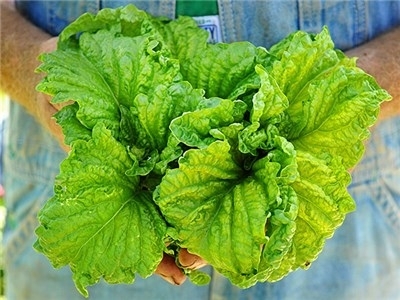 It produced beautiful three- to five-inch frilly leaves, easily making bouquet-like bunches when we picked it. For several weeks no one bought any Lettuce Leaf basil at our little stand, so one week we gave everyone who stopped a bunch of it. And the next week, everyone came back for more. Much milder than the better-known basils, Lettuce Leaf has a softer, creamier basil flavor and is mild enough to substitute for lettuce in your salad, pile on your sandwiches or throw in your juicer along with other vegetables. There are several online sources for Lettuce Leaf seeds; it may be harder to find as seedlings in nurseries. Basils are beautiful and compatible interplanted with roses but are vulnerable to aphids. Pay attention to your plants and rinse them with a spray of water as needed. Just when I thought I had seen them all, I found an article in Fine Gardening on a basil called Pesto Perpetuo. Three qualities distinguish this basil. It does not flower; it has a columnar growth habit, sometimes reaching six feet; and it has a white-rimmed variegated leaf. Interesting, right? Google it. Workshop: UC Master Gardeners of Napa County will hold a workshop on “Growing Tomatoes” on Saturday, April 6, from 9:30 a.m. to 11:30 a.m. at University of California Cooperative Extension, 1710 Soscol Avenue, Napa. Join our experienced tomato growers for tips and tricks on cultivating perfect homegrown tomatoes. Learn the latest research on tomato cultivation and care, and discover new and heritage tomato varieties. You'll get all the information you need to grow delicious and beautiful tomatoes in your own large or small garden or in containers. Growing America's favorite garden fruit is not only fun and easy, but also the best way to acquire healthy food for you and your family. Online registration (credit card only); Mail-in/Walk-in registration (check only or drop off cash payment). Demonstration Garden: UC Master Gardeners of Napa County have begun the process of re-establishing a demonstration garden in Napa Valley. For further developments, please visit the Demonstration Garden link on our website ( http://napamg.ucanr.edu/).